These are the preferences you can find in the Drawing tab. • Normal: The onion skinned drawings is displayed in washed out colours. 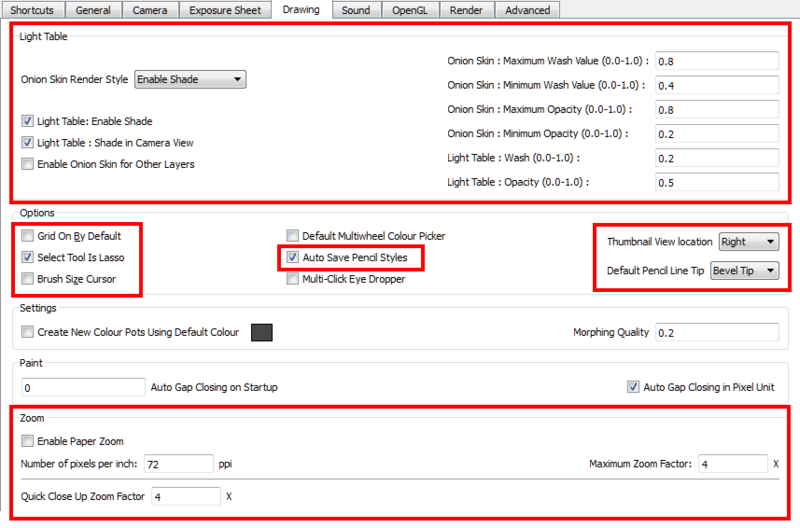 • Light Table: Enable Shade: When enabled, the drawings appearing in the Light Table are displayed in washed out colours in the Drawing view. When this option is disabled, the drawings appearing in the Light Table are displayed using normal colours. This option is for the Drawing view only. • Light Table: Shade in Camera View: When enabled, the drawings appearing on other layers are displayed in washed-out colours in the Camera view. When this option is disabled, the drawings appearing on other layers are displayed using normal colours. This option is for the Camera view only. • Enable Onion Skin for Other Elements: When both Onion Skin and Light Table options are enabled, the drawings appearing in the Light Table also display their previous and next onion skinned drawings. This option is for the Drawing view only. • Onion Skin: Maximum Wash Value (0,0-1,0): The maximum washed-out value for onion skinned drawings. • Onion Skin: Minimum Wash Value (0,0-1,0): The minimum washed-out value for onion skinned drawings. • Onion Skin: Maximum Opacity (0,0-1,0): The maximum opacity value for onion skinned drawings. (0 = transparent). • Onion Skin: Minimum Opacity (0,0-1,0): The minimum opacity value for onion skinned drawings. (0 = transparent). • Light Table: Wash (0,0-1,0): The washed-out value for the light table display. • Light Table: Opacity (0,0-1,0): The opacity value for the light table display. (0 = transparent). • Grid On By Default: When opening the Drawing view, the grid displays automatically. • Select Tool is Lasso: When this option is enabled, the Select tool behaves as a lasso selector. When this option is disabled, the Select tool behaves as a rectangle selector. • Brush Size Cursor: When this option is enabled, the brush tool displays the brush size as a circle around the cursor. • Auto Save Pen Styles: When this option is enabled, new pens and pen styles are automatically saved. • Thumbnails View location: When sending a series of drawings to the Drawing view, the drawing list appears in a Side panel. This preference changes the location of the Side panel in the Drawing view. By default, the panel is displayed on the right-hand side of the Drawing view. You must restart the application for this change to be applied.